Long before Buddy Holly and Elvis Presley were known, Bill Haley & his Comets were carving rock ‘n’ roll history. Although often not considered as one of the pioneers of the Rock ‘n’ Roll movement, they were actually at the forefront with hits such as ‘Shake, Rattle and Roll’ and ‘Rock Around The Clock’. 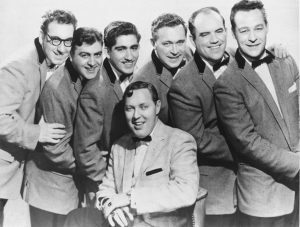 After leaving school at the tender age of 14, Bill Haley first made his way into music via several small country groups, and by the time he was 21, he had recorded his first album with the Downhomers. He stayed just a couple of years before forming his own band, Four Aces of Western Swing (later changed to the Saddlemen). By 1952, following some limited success, the band changed their name yet again, this time playing on their frontman’s celestial inspired name, they became Bill Haley & his Comets. Not only did they change their name but also their stage presence, taking into account what the younger generation seemed to enjoy. The group first hit the UK charts in December 1954 with their top 4 hit, Shake Rattle and Roll. It was quickly followed in January 1955 with Rock Around the Clock, the only single released by the group to get to the number one spot on the UK charts, it managed to stay there for 5 weeks. At this time, none of the well known Rock ‘n’ Roll kings were anywhere near recording contracts, but just a few short years later, the band found themselves competing with the younger, and extremely popular Elvis Presley, Chuck Berry and Jerry Lee Lewis. The competition was not as tough in Europe, with France, Germany and England welcoming the band with open arms and screaming fans. Although the band saw several line up changes over the years, they continued to perform when they had the opportunity. Unfortunately, Bill Haley passed away in 1981 and so Bill Haley & his Comets as we know it, simply ceased to be.